For you trivia fans: Mounds are made with dark chocolate. Almond Joy is made with milk chocolate. Almond Joy has nuts, Mounds don't"
Some jingles you'll never forget! 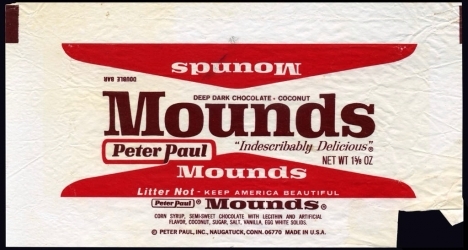 My mother always bought Mounds.She loved them! These, and Almond Joy, are still around, but they are now owned by Hershey.